ISUMI, CHIBA PREF. - At first glance, it’s hard to believe a small, cute deer-like animal can do any harm. 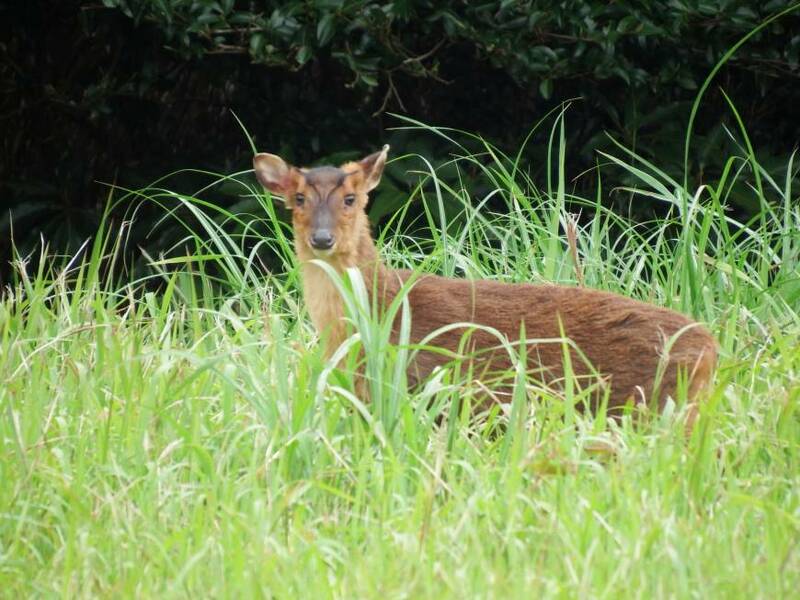 But the alien species Reeves’s muntjac — called kyon in Japanese — is now increasing in numbers at an explosive pace on the Boso Peninsula in Chiba Prefecture, causing headaches for local farmers and residents annoyed by damage to crops and plants. Kyon, originally from Taiwan and southeastern China, were kept in a local amusement park in the city of Katsuura in the prefecture. The park closed down in 2001. But some of the animals are believed to have escaped the park in the 1980s, and they have since been breeding at an staggering pace, a local government official said. The number of kyon was estimated at about 50,000 as of last year, up from about 1,000 in 2002, according to the Chiba Prefectural Government. Kyon are similar to deer but smaller. An adult kyon weighs only about 9 to 10 kg, while Japanese deer usually weigh around 40 to 60 kg. Farmers are complaining that kyon are eating their rice and strawberry crops. Local residents aren’t happy because they often munch on planted flowers and leave droppings. The animals have so far been spotted mainly in nine cities and towns in Chiba — Ichihara, Isumi, Otaki, Onjuku, Katsuura, Kamogawa, Kimitsu, Futtsu and Kyonan. “I came here four years ago. At first I was quite surprised to see kyon in this town,” said Kumiko Kuga, the head of Namihana Nursery Center in the Oharadai district of Isumi. She and the children at the day care often see kyon roaming nearby. On one occasion, a kyon entered the premises, probably through a small space under a gate, and in to the playground, Kuga said. Kyon aren’t likely to pose any harm to children. But they eat flowers and sometimes shriek, Kuga said, which is why she wants them kept away. Another woman in her 60s in a residential area nearby said she spots kyon almost every morning as she walks her dog. “The number has increased in particular over the past one or two years,” said the woman, who declined to give her name. The woman didn’t seem to consider kyon a big deal. But that’s not the case for the Chiba Prefectural Government. In 2000, it designated kyon an alien species that should eventually be exterminated to protect Japan’s indigenous environment. Indeed, kyon are very fertile. According to the prefectural government, female kyon can reproduce at as early as 6 months old. Once pregnant, they give birth in only six to eight months. In Chiba, kyon have no particular natural enemies and are blessed with various plants to eat. The high fertility rate and the amicable environment has helped the animal breed at such speed that local hunters tasked with tracking them down haven’t been able to keep up, said Yasushi Chimura, a prefectural official. Hunters hired by municipalities in Chiba managed to kill only 2,187 kyon in 2015, lagging far behind their breeding, officials said. Meanwhile, local hunters may have few reasons to hunt for more. Given their small bodies and relatively high cost to capture, kyon meat is not usually sold for human consumption. After hunters catch and kill them, they have no choice but to simply bury them, Chimura said. That’s why the city of Isumi is now manufacturing products made of kyon skins, such as baby shoes, to spur demand. 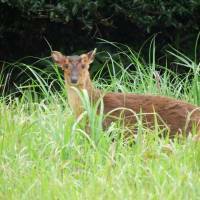 Last year, local hunters in Isumi caught about 400 kyon and about 30 hides have been tanned. But the project is still in “the trial stage” and the city is not sure yet if it will be commercially successful, said Hideyuki Kuga of the municipal government’s forestry section. “We hear the quality of kyon skin is really good. But we are still searching” for ways to utilize it, Kuga said.